Dinner was interrupted this evening by a knock on the door and subsequent notice that about one third of the foliage in our front yard breathed its last. We have two large trees in the front yard and before today I couldn’t have told you if they were bonsai’s or apple trees. Turns out the one closest to the house was a Silver Oak which was starting to rot on the inside. 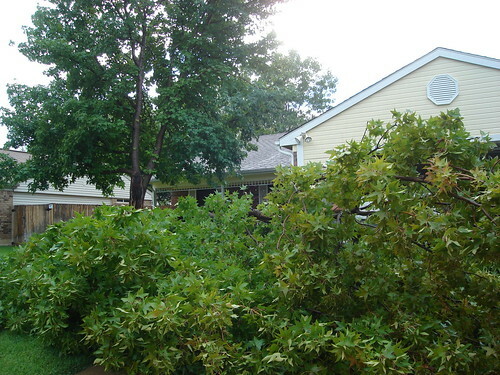 Luckily, the first third of it to go was the section pointed away from the house and towards the driveway. Our neighbor from across the street watched it slowly peel away from itself from the friendly confines of his garage/living room. He was kind enough to come over and inform the kid and I about it and then offer to bring his chain saw to help us clear the driveway as well. We were both in agreement that the whole thing should probably come down since the direction the next section would head is C’s bedroom. 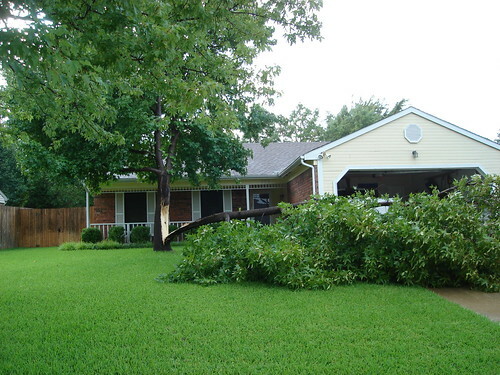 Any recommendations on a good tree removal specialist? One preferably bonded and isn’t your typical “neighbor’s cousin?” No earthly idea what the cost is but I am going to guess in the $750 dollar range for a tree the size of ours. I’m also not a fan of leaving the stump so that will more than likely cost me more to have it removed or ground down. On one hand I hate to see it go. It provided large amounts of shade and was nice to look at. On the other hand I won’t feel too bad once fall rolls around when I don’t have to pick up the 14,000 individual spiked-fruit it nestled nicely in my lawn. I guess we’ll be in the market for the annual $80 tree sale that our town puts on next time around. A couple of pics of the carnage. Ah man! What a mess. Even though it was rotting from the inside…it’s still nice and green! What a bummer!